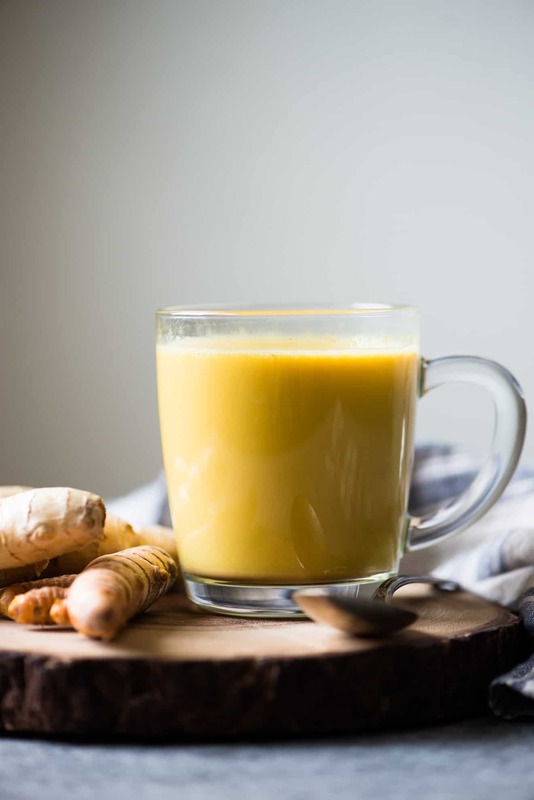 Golden milk (or turmeric milk) is filled with antioxidants and has anti-inflammatory properties. Making it at home is incredibly easy. All you need is 5 basic ingredients! For the record, I checked my phone a total of 19 times while creating this post. I know, my problem runs deep. Hide the phone during the day. Hide the phone during the day. This point bears repeating. 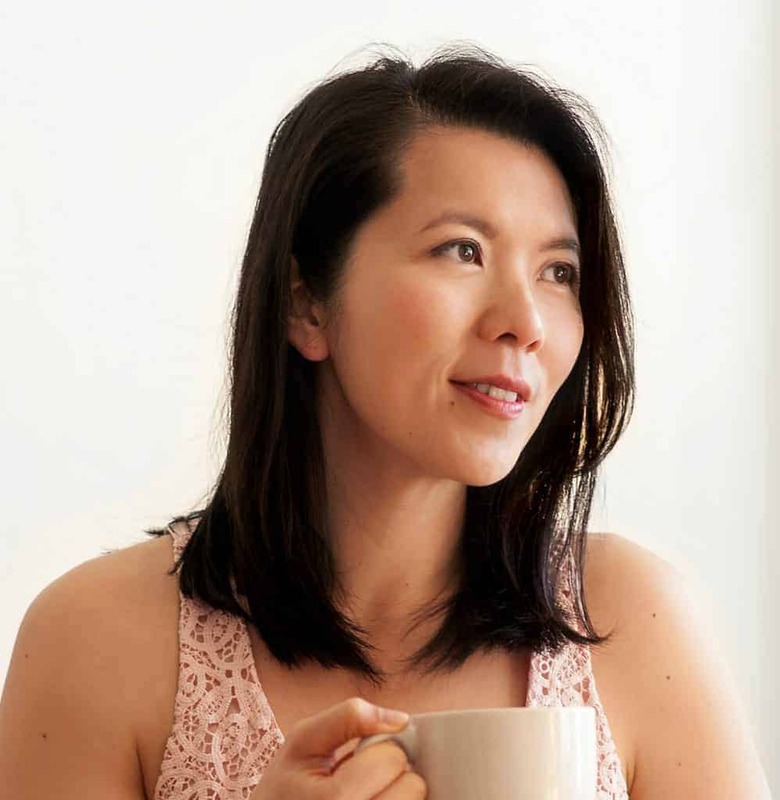 Perhaps this website is a bit of a food journal for me, but I want to establish a practice that doesn’t involve staring into a brightly lit screen where distractions abound. Over the past week, I have started journaling more, and it’s very cathartic to release all of my thoughts onto a 5×8 piece of paper. My moments of journaling zen are often accompanied by a warm beverage. Lately, it’s been golden milk. 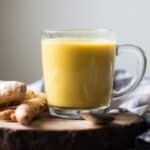 For those of you who have never heard of golden milk, it is essentially a warm beverage with turmeric, milk and spices. 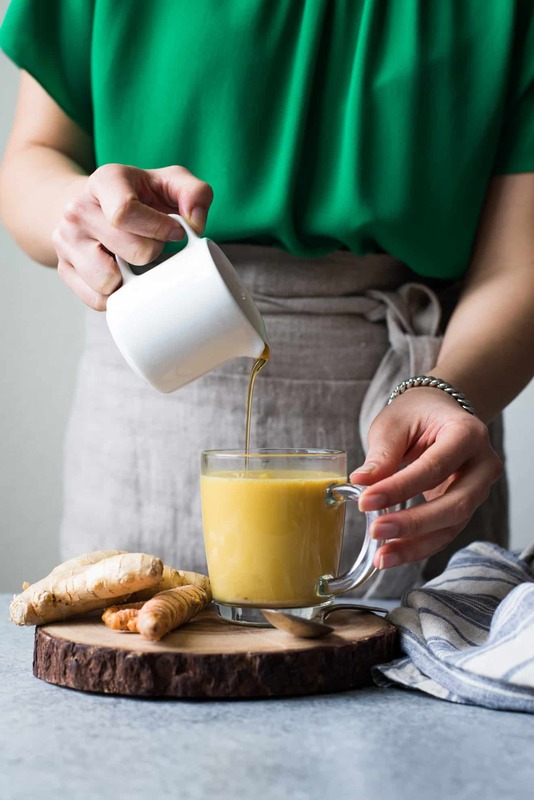 Besides nourishing our mind and body, golden milk is filled with antioxidants and anti-inflammatory goodness. We can thank the turmeric for that. Turmeric has a bitter aftertaste. If you have never tried golden milk before, I recommend going slow with just a 1/4 teaspoon of ground turmeric to 1 1/4 cups of milk. Once you are accustomed to the taste, start adding more turmeric. Do note that turmeric doesn’t dissolve well in liquids. If you add too much, the turmeric will just settle at the bottom and you’ll find a thick layer of turmeric when you reach your final sip. Fresh versus ground turmeric: Because fresh turmeric can be difficult to find, I decided to develop the recipe with ground turmeric. In terms of taste, I prefer fresh turmeric slightly more because the flavors are more gentle and I don’t have to worry about turmeric powder settling at the bottom of my cup. 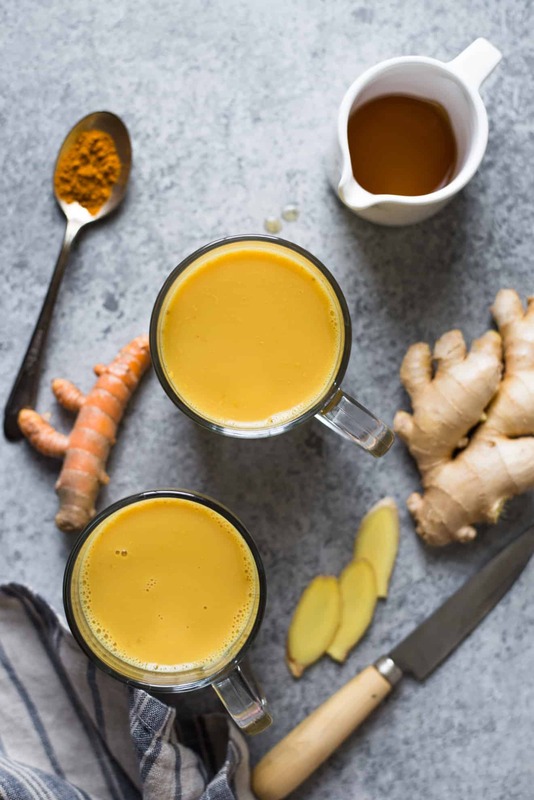 In terms of aesthetics, the color of golden milk made with ground turmeric is the prettiest. It all goes down to personal preference. If you use freshly grated turmeric, I would use about 3/4 to 1 teaspoon for this recipe. Warm up milk on low heat: Make sure to heat up the milk on low heat. I have found that warming up the milk on low heat is the best way to preserve the bright color of the golden milk and helps prevent the milk from burning. You can use any kind of milk: I used almond milk in the recipe because of its neutral flavor. Feel free to use any other kind of milk that you prefer. How to get rid of turmeric stains: I have never cooked with turmeric without staining every surface in sight. (CONFESSION: There were splotches of yellow stains on my photo surface after filming the video for this recipe. Oops.) Turmeric is one of the toughest stains to clean. Fortunately, I have found a good solution for cleaning up the mess. Make a fairly thick paste with baking soda and water. Add a little squeeze of toothpaste to the mixture. Rub this mixture over the stained area and let it sit there for 8 to 10 minutes. Use a damp cloth to wipe away the stain. The golden milk is best consumed while it’s still warm. You can always spice it up more by adding a dash of freshly ground black pepper or cardamom when you are warming up the milk. For a bit of decadence, mix in a 1/4 to 1/2 teaspoon of virgin coconut oil right before drinking. I used maple syrup to sweeten the golden milk, but feel free to use whatever sweetener you prefer. Add the almond milk, turmeric, cinnamon and ginger slices into a saucepan. Stir to combine the ingredients. Heat the milk on low and bring to a low simmer. This will take about 5 minutes. Once the milk bubbles in the center, continue to let it simmer for another 4 to 5 minutes. Remove the saucepan from heat. Using a mesh sieve, strain out the solids over a measuring cup with a spout. This will make it easier for you to pour the golden milk into cups. Pour the golden milk into 2 cups. Drink while the milk is still warm. Read the notes above for spice variations. I just saw this comment–sorry for the late reply! I love the idea of keeping a paste in the fridge! I will have to try that! Hi Lisa! ❤️ your recipes and posts! I must have been living under a rock as I have just found you on IG. I wanted to say Hi and let you know that I would love to send you some Hey Boo Coconut Jams and Caramel Sauces to play with. Please let me know if that’s 👌 or if you have a way of working with brands, then please let me know also. I’m so sorry that I never got back to you! It turns out that we have a mutual friend!! 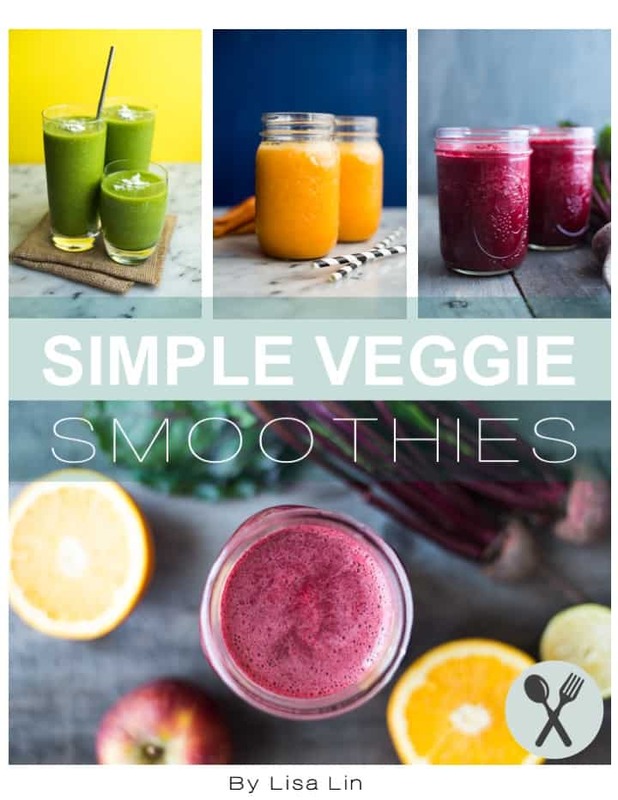 Great simple recipe! This is super soothing for my stomach. Any tips on what kind of ginger to add to give it a kick? Hi, Tracy! First of all, I just realized that the ginger slices didn’t show up in my recipe card!! Anyway, for a stronger ginger kick, I would add slices from a 3/4 to 1-inch piece of ginger. Slice the ginger pretty thinly and add to the saucepan the same time you add the other spices. Black pepper is an important addition, it increases the bioavailability of the turmeric. Not much is needed, I use a shake or two because I also like the warmth it gives. I’ve used honey in the past because it also has anti-inflammatory properties. But…I think the maple syrup will add a delightful flavor, and look forward to trying this! Thanks for the lovey recipe and your advice on cleaning turmeric stains safely and chemically free. I’m super excited to try this recipe; I have been using turmeric with cinnamon (and spirulina) just mixed with cool water and drunk as a “shot” each morning, since learning that turmeric is a natural anti- depressant. It works every bit as well as the sertraline I took for years, and it never even occurred to me that there might be an established turmeric beverage to try. The combination of cinnamon in this drink also makes it perfect for sacral chakra work. Thank you, Lisa! Is powdered ginger okay for a substitute? Yes! I’d start out with 1/2 teaspoon first, and add more if you want more flavor.